MLS Cup – LA Galaxy 3-1 Houston Dynamo – 4-4-2 vs 4-4-2 but set pieces help Beckham go out a champion. All it took was five minutes. The home crowd were restless down 1-0 and 300 seconds later a party had started. As the clock moved to 58:58 the game seemed to almost freeze in time as Omar Gonzalez rose high at the far post unmarked and headed his side a vital equalizer. This was now Houston’s acid test. We’d heard all week about how great it was for MLS to give the highest seed home advantage and now it was time to see why it was called home advantage. The energy inside the Home Depot Center changed, the confetti flew everywhere and on the pitch Houston couldn’t keep the ball. For the next five minutes they failed to put together three successive passes, allowed Robbie Keane to put the ball in the back of the net (disallowed for a foul in the box) and crucially committed three fouls, including one on Keane by defender Bobby Boswell that led to a David Beckham free kick. While everyone watching expected the Englishman to swing it on target he went short, over the wall, and on to the familiar head of Gonzalez. As the defender won the crucial header in the box, the time showed 63:58, and a second later Mike Magee’s overhead effort hit Boswell’s hand in the box and LA had a penalty. Landon Donovan would step up and make it 2-1. Game over. Five minutes is all it took for LA to find top gear and undo all of Houston’s good work for the previous 59. Free spins can Bonus Casino Slots also form part of the welcome bonus. Coming back from 1-0 down, scoring an equalizer that triggered a barrage on their opponent that led to a penalty to make it 2-1 five minutes later is exactly how LA had started their playoffs against Vancouver on November 1st and it proved the potion for success precisely one month later. Until those five wild minutes, the MLS Cup final had been an excellent tactical battle between two very different versions of 4-4-2. Bruce Arena again went with Donovan playing just off Keane with Mike Magee and Christian Wilhelmsson playing as true natural wingers. 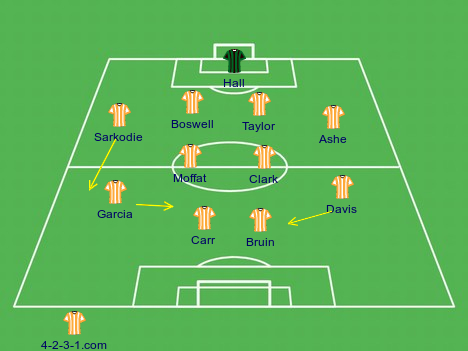 Dominic Kinnear’s Houston also went with two up top but had two wide players, Oscar Boniek Garcia and skipper Brad Davis, who were very comfortable cutting in and playing in behind the strikers. It proved to be a vital tactical difference that made a significant impact on how Houston played and why LA struggled to. The first half of the match was not played at such a high tempo that the second half was and that suited Houston and allowed their wide players to take hold of the game. Captain Davis, who missed last year’s final through injury, was, not surprisingly, their most influential player when they attacked and it was his overall intelligent movement that turned the tide towards his side early on. A look at his successful passes on MLS Chalkboards shows just how much room he covered. Only one other player in the match completed more passes than Davis and that was left back Corey Ashe who benefited from his team-mate’s movement down the left flank. When Houston would break, one of Davis or Garcia would always come inside making up a three in midfield, which meant neither Ricardo Clark or Adam Moffat felt the pressure to get forward and out of their defensive shape. This also pushed Juninho and David Beckham, LA’s two best passers by some margin, deeper, limiting the amount of danger they could cause. In fact, LA’s best two chances of the first half came through Beckham, one at a free kick which Magee headed wide and the other when the 37-year-old picked up the ball in front of his own box and sent Keane loose on the left side. With Donovan sprinting alongside him and then being fed the ball, it was an attack that should have put LA ahead, but instead the American shot wide. It appeared to some – including ESPN’s panel at half time – that Houston’s midfield duo were too deep and needed to get higher on Beckham to stop such great long-range deliveries. To me, they were exactly where they needed to be. Clark and Moffat were doing an exceptional job sitting deep and being outlets for a backline, and goalkeeper, who like to play out from the back. With Davis and/or Garcia cutting in there was always someone for them to be able to find and with Beckham and Juninho being pinned deep, Moffat, in particular, had licence to often pick the ball up and stroll 30 yards without being pressed, which is precisely what happened in the 43rd minute when Houston scored. The play was started by Hall who rolled it out to the Scotsman who then played an easy 1-2 with Garcia, before strolling into space untouched. The lively Calen Carr then made a great run in between both centre-backs, stayed onside, and was picked out by Moffat and sent in clear on goal. Carr then took his time, waited for the poor Josh Saunders to go down, and slotted home at the near post. Donovan & Keane – 2 men doing 4 people’s jobs. You can always tell which players are tactically intelligent by watching trends develop in the first half and seeing which players react to it without waiting for instructions from their manager at half-time. Seeing what Moffat & Clark were doing, both LA’s front men started coming deeper and pressing them. In fact, at one stage late in the first half, Donovan won the ball that way and the transition led to another chance but the pair couldn’t do it regularly because they needed to occupy Boswell and Jermaine Taylor up top. Galaxy’s wide men in Mike Magee and, in particular, Christian Wilhelmsson did very little work in this area. They may well have been instructed to stay close to the line and stretch the side’s shape but LA suffered because of it. At half-time I wondered if Arena would bring Donovan back to right wing for the Swede and ask Edson Buddle to play alongside Keane. This would put his captain in a place where he could defend the position better when Houston attacked and occasionally cut in and create triangles inside when he had the ball, something he has done exceptionally for the USA in recent years. It was a move Arena made later in the match but not until his team had scored twice. Houston’s shape and tactical awareness always meant LA would always struggle to score from open play. It seemed like they were at their most dangerous on a fast break or via a set piece and it was the latter that would lead to their two goals. A minute before they conceded the first they crucially lost Carr to injury and he would be prove to be a big loss in the air when it would come to marking opponents in the box. Davis, now back defending his left flank, was the first culprit when he defended a cross with his arm and gave away a free kick on the right side. Swung in by Beckham, it was knocked out for a corner and although that was partially cleared, Gonzalez and company were still in the box when Juninho swung a ball in that the central defender headed home. After that the game changed, five minutes of madness for the Dynamo and a quicker tempo from the Galaxy culminated in the penalty that put them ahead for good. By the time Robbie Keane won another spot kick it was injury time and Houston were over committing knowing the game was practically over. The Irishman made it 3-1, Beckham was taken off to get his final moment and seconds later he was back on the pitch celebrating his second successive Major League Soccer Championship. He was not the game’s best player – that vote would rightfully go to Gonzalez – and for a stretch of the game he got outplayed by his direct opponents in midfield but it was fitting that in his final game he was the architect of Houston’s downfall. Beckham has always been at his best behind a set piece and it was those that made the difference in his final match in MLS.